Both, the record label from Germany and its mastermind, Michael Rheinboth, have long since defied all attempts at tagging it with the catchword Nu Jazz. House, Broken Beat, Jazz, Folk, and Pop can be found equally in the label catalogue. In order to celebrate the anniversary, a diverse posse of artists has announced coming to Munich with a similarly great variety of musical gifts in tow. Downbeat inventors Kruder & Dorfmeister are exclusively going to fly in over the Alps from Austria and London’s high priest of Jazz, Gilles Peterson, is personally going to deliver his musical congratulations with an unbridled DJ set. Also, an appearance by DJ Hell (Photo above), the great Munich Club Gigolo, who is going to perform one of his sets ranging from New Wave and Techno to oldschool House, is of course a point of honour. Further highlights of the grand celebrations are DJ guest performances by Berlin’s Jazzanova Crew, Alex Dallas from Switzerland, and Brit Earl Zinger. The trio Marbert Rocel from Weimar and Erfurt is going to introduce their second album Catch A Bird soon to be released on Compost Records. 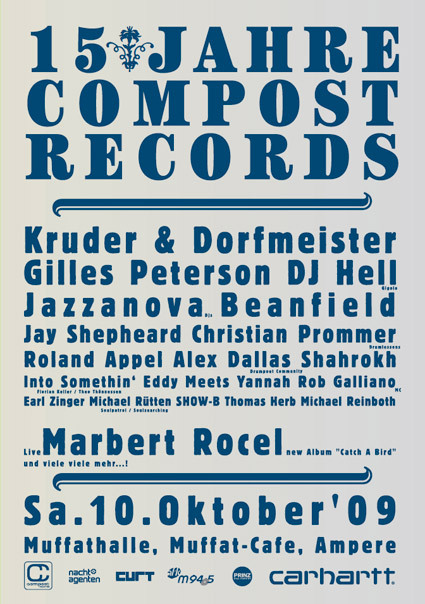 It is going to be an anniversary bare of any one-dimensional styles and with a line-up that serves as an impressive accentuation of Compost Records’ musical diversity.